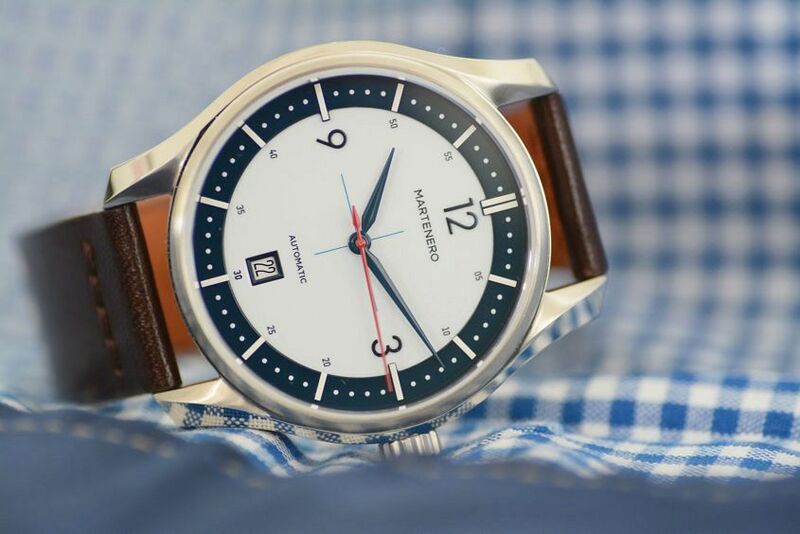 Since 2014, New York-based Martenero have been quietly making a name for themselves amongst the enthusiasts of the microbrand watch community. Their formula is of simple dials with bright pops of colour, paired with a twisted lug case – with the exception of their straight-edged Edgemere – brought to life by a desire to create classically-styled watches with a clean and modern look. This year they’ve taken a far-reaching approach to expand their five-watch catalogue, with their sixth release launched via crowdfunding website Kickstarter. The Kerrison more than tripled its pledge goal and I expect we’ll see it become a regular part of the stable next year. If you’re already familiar with Martenero, you might recognise the Kerrison’s basic design and silhouette. It’s a reimagining of one of their earlier models, the Marquis. The brand’s dressiest option and their most traditional. However, the Kerrison takes on a more casual everyday vibe that, in a pinch, can also answer the call up to suit duty. Some fine-tuning and a selection of brighter colourways. And it’s their most versatile watch to date. Spanning the line between dressy and sporty. Starting with a face that’s largely unchanged. 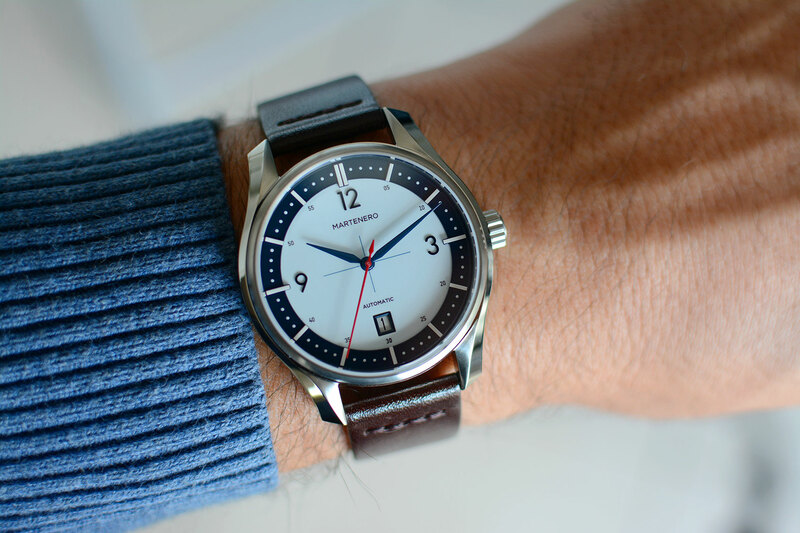 The Kerrison uses the same dial layout as its inspiration. Date at 6 o’clock with a crosshair centre, surrounded by an outer 3D-style minute track with applied rectangular hour markers. Only now, the traditional Roman numerals of the Marquis are replaced by more affable Arabic numerals. A small change that instantly relaxes the overall look and feel of the Kerrison. To add to the versatility, there’s also a choice of different dial finishes and colour combinations. There’s a matte dark blue, a glossy white and blue, a matte black and glossy dark blue, and finally a matte white and sunburst silver. Each one easily dressed up or down. Although in my opinion, none better than the glossy white and blue I had in for review. 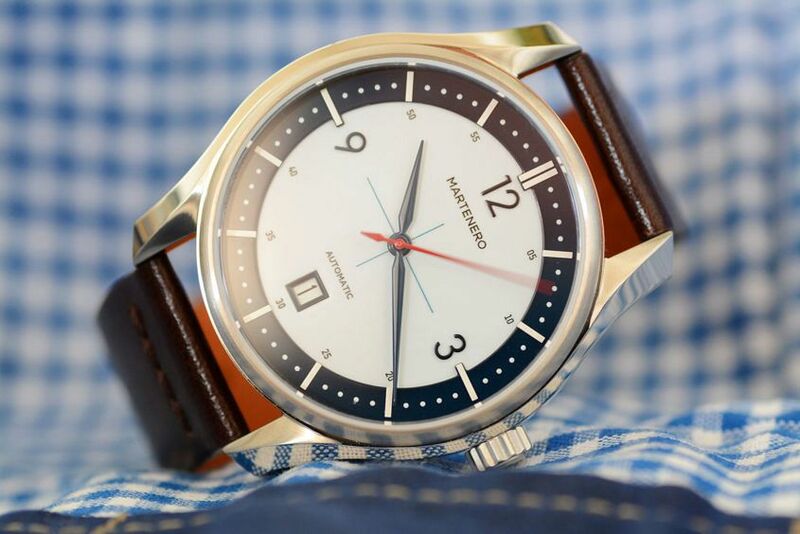 The pop of red against the backdrop of white and blue – to me at least – perfectly summing up Martenero’s design ethos. Following the brand’s something-for-everyone approach, the Kerrison is also available with two choices for case sizing – a 42mm and 38mm. The version I looked at was the 42mm and I found that it wore quite true to size. It’s relatively narrow thickness of only 10.8mm sitting low against the wrist and helping to counter the elongated lugs. As I mentioned earlier, the shape of the Kerrison’s case is not exclusive either. It’s twisted lug design is much loved by the brand (and its fans). And it’s easy to see why. Alternating polished and brushed finishes accentuate the curves, and shine the light on subtle twisting lines. Inside is the ubiquitous Miyota 9015. Not at all unexpected at this price, and a movement that has become almost a staple of the microbrand industry. With hacking seconds and a power reserve of 42 hours. It’s a proven and reliable automatic movement that’s perfect for anyone dipping their toe into the mechanical watch world. Especially when paired with a watch as versatile as the Kerrison.